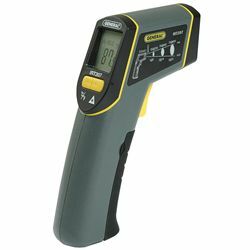 By measuring infrared radiation, this non-contact thermometer can tell you the temperature of any surface with the touch of a button. Lightweight and portable, it's useful for lots of do-it-yourself projects, including PC maintenance, automotive inspection, HVAC applications, food prep, metallurgy and much more. Requires one 9V battery, included.